Imagine a rectangular plot of land, let’s say 100 by 75 feet. Four or so small row homes occupy part of the space. There’s also a building for common use, containing a living room where residents might chat, watch TV, peruse newspapers and magazines, or delve into a donated book from the shared library. A kitchen for the preparation of group meals as well as a bathroom and a spare bedroom for residents’ guests are available. Nearby, topped by a green roof, is a bicycle shed that also serves as a recycling center. A small community teahouse built from cob—a mixture of clay, straw, and sand—offers a further space to gather. 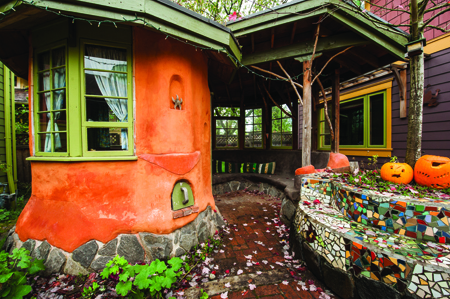 Framed into 8–inch exterior walls, staggered studs provide lots of room for insulation, and the buildings’ exteriors boast brightly painted facades, reminiscent of fairytale houses in children’s books. The woodwork around windows and gables is lovingly crafted. Each home has its own cozy, covered porch for relaxing, chatting, and enjoying the view of ornamental, edible, native or drought-resistant plantings. Whimsical artistic touches include recycled musical instruments and bicycle parts slipped into ornate railings and trellises. A small courtyard sporting fanciful yet elegant circular brickwork provides perfect summertime potluck space. The interior spaces are well-used and supplied with a plethora of “green” features: Elegant live-edge maple sills grace triple-glazed windows, the shape of the sill following the gently curving grain of the wood. The floors are of Forest Stewardship Certified bamboo. In-floor radiant heat or “mini-split” heat pumps warm the air. Appliances are Energy Star. Low-flow showerheads and faucets use little water, and toilet-tank–top washbasins occupy minimal space. One of the quirks of Spevak’s building acumen is his ability to transform objects such as old musical instruments into architectural gems that adorn trellises or porches. Residents of all ages, genders, and ethnicities coexist. Some are single, others married with or without children. Some are empty-nesters. Bicycles rather than cars are the preferred mode of transportation. All enjoy a neighborly lifestyle—sharing values, skills, possessions, laughs, and square footage in a green and inexpensive environment, yet retaining ample privacy and personal space. If this sounds like a vision of a modern utopia, that’s because it is—at least for the Portland, Ore., residents who live in the communities created since the mid-2000s by Eli Spevak ’93. His vision for more community-oriented housing is both idealistic and realistic, generous in spirit, easy on the environment, and practical yet intrinsically human. A native of Washington, D.C., Spevak arrived in Portland in 1994, intending to stay three months building homes for Habitat for Humanity. He enjoyed life in Portland and “sort of extended” his stay, acquiring a master’s in urban and regional planning at Portland State University while developing affordable housing for nonprofits Human Solutions and the Housing Development Center. In 2003, Spevak and a friend purchased a rundown seven-unit courtyard complex, which they converted to six condominium dwellings with one shared unit. They named it Peninsula Park Commons after an adjacent park and sold units to friends in 2005. “As the homes were relatively small, we thought it would be nice to have a shared space where residents could meet and eat together and have guests stay over,” he says. Working on this first project, Spevak says, he learned a tremendous amount about cohousing and community-oriented design and was enthusiastic about continuing to do it, all the while devising new ideas for improving the design and the human dynamics of the communities. In 2008, he married Noelle Studer (sister of Eric Studer ’97), and the couple had a daughter, Ozora, now 3. The young family lived in Peninsula Park Commons, enjoying the lifestyle for which the community was intended—occupying small spaces in attached dwellings while sharing ideas, pastimes, dinners, and possessions with the other residents. 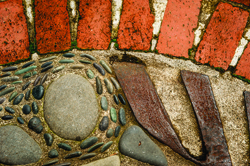 Swirling patterns in colored brick and stone beautify his courtyards. Today, Spevak is the owner of Orange Splot LLC, a development and general contracting firm, which, builds small, energy-efficient, community-oriented cohousing developments similar to the one described above. When necessary, he still climbs on ladders and frames roofs. “I’ve always worn many hats,” he says. He’s also often called upon to share his expertise with students, contractors, architects, planners, attorneys, and developers. 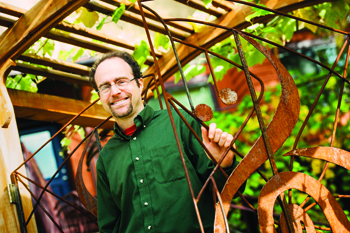 Since that time, Spevak has been pursuing his dream, living in and developing cohousing communities. He uses building and zoning codes in creative, sometimes unexpected ways to form small clusters of homes with shared common spaces where it’s easy for residents to cross paths, make friends, and establish a culture of sharing. Spevak’s homes are small to modest in size, ranging from 500 to a little more than 1,500 square feet. 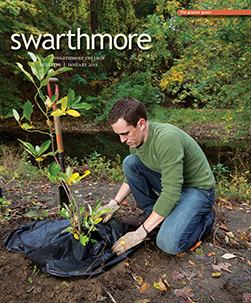 “In terms of green building, the best thing we can do is to build smaller homes,” says Spevak. 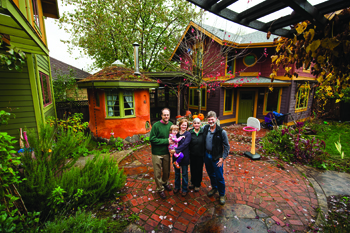 “A 2,200-square-foot home that is LEED [Leadership in Energy and Environmental Design] rated and super efficient is no better for the environment than a 1,600-square-foot house built to basic building codes.” Spevak notes that smaller homes are also more affordable, better suited to emerging demographic trends for households, quicker to clean, and a natural obstacle to excessive accumulation of stuff. 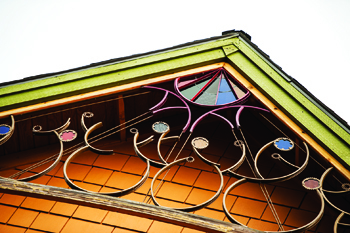 Powder-coated bike parts are used as ornamentation to enhance Spevak's roofs. Sabin Green residents also watched the presidential debates together, and once a year they go away for a long-weekend retreat to plan community activities for the coming year. When seeking new development sites, Spevak looks for spaces that are located on bus routes or other transit lines and adjacent or close to parks. “Location makes a huge difference,” he says, “and the scale of the projects I do, which are relatively small, makes it easier to find suitable lots, even in a city like Portland, which is pretty built up.” He adds that he is now sufficiently well-known that people contact him about properties they believe he might wish to develop. In December 2011, the Spevaks moved out of Peninsula Park Commons into a rented house across from the future Cully Grove site. “I try to do projects within easy biking distance from my house,” he says, chuckling. His family misses the perks of shared community life and anticipates moving into their new Cully Grove home this June. Sabin Green, the home of Rosemarie and David Sweet (on the right), is one of the communities Spevak (left) created. Later this year, the Sweets will move to Cully Grove with Spevak, his wife, Noelle (center), and their daughter, Ozora, 3. Located on two acres of grassy land, Cully Grove will consist of 13 1,500-square-foot homes in two- and three-unit buildings and three 1,780-square-foot detached homes. Each will be sustainably designed and durably built with super-efficient heating systems; tile, marmoleum, and oak floors; cast-iron tubs; Shaker-style cabinets; handcrafted cedar trellises; and green roofs on carports. Shared common amenities will include an outdoor kitchen, courtyards, 4,500 square feet of gardening space, an onsite well for irrigation, and a common house with a gathering space, small kitchen, and two guest bedrooms upstairs. This development will have a “farm in the city” theme, in which residents cultivate fruit trees—some of which are already established on the site—as well as berry bushes, while growing their own produce and flowers in individual plots. They also plan to raise chickens, ducks, bees, and maybe goats. Part of Spevak’s genius is that he not only creates the physical components of communities but spends time and energy on the process through which buyers assemble into, ideally, a compatible group. The residents of Cully Grove will include six empty-nester couples and eight families with children, who, he says, are the groups most likely to be attracted to cohousing communities. “It’s a great, intergenerational mix,” he says.